PurePro Luxury RO system is a modern kitchen appliance that has been carefully designed with health consciousness, efficiency, high performance and convenience in mind. PurePro Luxury RO system uses 100GPD membrane which is powerful, fast and excellent efficiency. 100GPD membrane increase the daily production capacity and the speed of RO water production. This allows for better assurance that there is adequate water available when desired, even during heavy use times of the day. PurePro Luxury RO with its supreme quality ensures a great water flow rate with absolutely the least wasting of water. PurePro Luxury RO system includes new best Euro-Luxury faucet which is the most beautiful, most elegant design in the world. This faucet can make an important aesthetic statement and can be an essential part of the style of your modern kitchen. 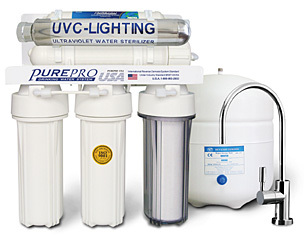 LUX-106UV system provides safe, pure water using Reverse Osmosis Technology. It is one of the finest units in its class. It uses no chemicals or electricity and provides premium water quality. It's capable of removing over 99% of total dissolved solids, +99% of all organics and +99% of all bacteria. Euro-Luxury Faucet. Supreme quality with elegant design.